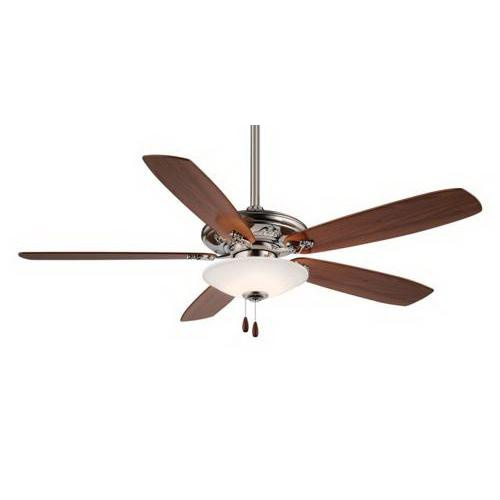 Minka-Aire Traditional Mojo ceiling fan comes with three 60-Watt E12 Candelabra/low-profile bowl light kit. It has five 52-Inch plywood blades in reversible medium maple/dark walnut finish that compliments any decor. Fan features pewter finish housing for corrosion resistance. Blade has pitch of 12-degree. This 3-speed pull chain/remote/wall control fan has flow rate of 2527 CFM at low-speed, 4065 CFM at medium-speed and 5699 CFM at high-speed. It features etched white glass shade. Fan has 153 mm x 15 mm motor for efficient performance. It has voltage rating of 120-Volts and current rating of 0.27-Amp at low/0.42-Amp at medium/0.56-Amp at high-speed. It is suitable for indoor use. It has power rating of 13.7-Watts at low-speed, 33.8-Watts at medium-speed and 66.1-Watts at high-speed. This fan is standard or angled mountable. It measures 52-Inch x 52-Inch x 11-Inch. Ceiling fan is UL/cETLus listed.